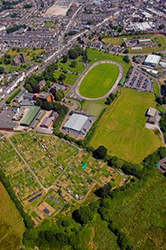 Situated on the west side of Carmarthen, with access off Monument Hill, the Five Fields allotments enjoy an open south-facing aspect. 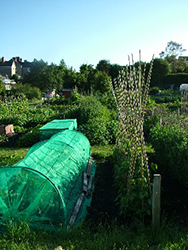 The allotments are managed by the allotment holders, and at present there is a short waiting list. If you are interested in taking an allotment in Five Fields please contact Peter Ellett 07792 193409. Situated on the east side of Carmarthen, with access from Priory Street, the Parc Hinds allotments enjoy a sheltered, south-facing aspect. The allotments are managed by the allotment holders. If you are interested in taking an allotment at Parc Hinds, please write to the Honorary Secretary, Pamela Williams 07879052154.